'Matchup proof' means a running back is startable no matter who he's playing against, and one way a receiving back becomes matchup proof is by defying game script. For example, if a running back finds his team down by 30 points in the first half and his team needs to pass more to get back into the game, he'll still accrue fantasy points because he'll likely be targeted on check down passes. While receiving is a big factor in creating consistency among RBs, it's not the only trait a running back needs to possess. He also must be a talented inside runner, a back who can generate tough yards after contact with big defenders on runs up the gut and also possess the vision and instincts to make sharp cuts up the field. This is even more true in zone blocking schemes. Among the traits listed above, Cleveland Browns running back Duke Johnson definitely fits the receiving mold, and while he hasn't shown the ability to run the ball effectively between the tackles, it's unfair to think he can't do it because he hasn't gotten a real shot at the team's 'feature back' role. He also possesses the kind of instincts and athletic ability required to make plays in the run game. In this piece, we will examine if Johnson could emerge as a breakout fantasy candidate in 2017. Going back to Johnson's receiving ability, it's very clear he's had potential in PPR leagues. Johnson was targeted 68 times in 2016, good for 5th most among all NFL running backs. He also ranked seventh in yards per reception at 9.7. Despite all this though, he only finished RB48 in PPR leagues, right around where T.J. Yeldon, Theo Riddick and Alfred Blue ended up. While the result wasn't ideal, the potential was definitely there given Johnson's role in the offense. More importantly, we've seen smaller receiving backs have very good fantasy seasons — even in standard leagues. One example of this is Danny Woodhead in 2015. Featured in a passing offense alongside Pro Bowl quarterback Philip Rivers, Woodhead finished as a Top 10 fantasy back in 2015 and it was largely due to his receiving stats. Woodhead caught 80 passes for 755 yards and scored six touchdowns that season. He was also targeted over 100 times total. Standing just 5'8, 200 lbs, Woodhead benefited from an offense that scored a lot, which allowed him to see 37 red zone targets in 2015, which far exceeded anyone else on the team. Like Woodhead in 2015, Duke Johnson's role in the passing game was prominent in 2016. Unlike Woodhead though, Johnson didn't have a Pro Bowl quarterback in Rivers throwing him the ball. He instead dealt with a merry-go-round of QBs that consisted of a still-inept Robert Griffin III, a veteran in Josh McCown who also struggled, and a rookie in Cody Kessler who was actually the best of the bunch. Overall, the poor situation hurt Johnson's touchdown value, as he saw only 14 red zone looks in 2016. If we're going to expect bigger things from Johnson in 2016, the Browns must improve their quarterback situation. Johnson also had to deal with playing second fiddle to Isaiah Crowell, who saw 34 red zone attempts in 2016 also. While Crowell was the team's dominant inside runner in 2016, he struggled with consistency as 518 of his 952 rushing yards came in four games, making him a liability from week to week. He was also woeful in pass protection. Crowell also finished out the final year of his contract in 2016 and the latest talk of an extension appears unlikely. While Crow managed 7 touchdowns and nearly 1,000 yards on the year, it's likely the Browns will want to spend their money elsewhere since Crowell was only valuable on first and second down and didn't change the course of the Browns dismal 2016 season. Crowell and Johnson are not too far off from each other in terms of talent either. According to Pro Football Focus, Johnson and Crowell graded out about the same in running and receiving. Plus, Johnson carried the ball only 73 times in 2016, which gives him less wear-and-tear for next season and makes you wonder if he could play better if he gets more carries in the offense. It's likely Cleveland will improve its situation at the quarterback position in 2017. Imagine if they locked down a quarterback like, say, Jimmy Garoppolo from New England? A quarterback with better accuracy could allow Johnson a lot more opportunity to catch the ball in stride and make plays out of the backfield. This will be something to monitor heading into the offseason. It's absolutely possible Duke Johnson could put together a 700+ yard receiving season given his talent, but he needs some help. He has the talent as a receiver and a good coaching staff that can maximize his skill set. He just needs a quality quarterback to go along with a bigger role in the offense next season. The latter variables could definitely turn in his favor in 2017. Keep an eye on how things fall together this offseason. With Josh Gordon suspended for the majority of the season, the Cleveland Browns needed someone to step up and try to fill some of the void left by Gordon. As many of our writer’s here at Fantasy Football Helpers have indicated, Andrew Hawkins has been the most consistent Browns receiver from a fantasy perspective. Despite not having the body of a typical no. 1 receiver (5’7”) Hawkins is quietly having a very successful year, leading Browns' receivers in targets (52) receptions (36) and receiving yards (471), showing to be quarterback Brian Hoyer’s safety blanket. This week Hawkins gets a juicy matchup with a Tampa team that has officially waved the white flag on the season after making a couple of trades at the deadline, including one for starting safety Mark Barron. The Buccaneers are currently giving up the most fantasy points to opposing wide receivers (29.4), and have given up a league-high 12 receiving touchdowns this season. Look for Hawkins to build on his hot-start as Hoyer picks apart the Buccaneers secondary this Sunday. First thing's first, Andrew Luck is an absolute monster and should be one of the leading candidates to be the NFL’s MVP at the half-way point of the season. Luck has not had a game this year with fewer than 300 passing yards, and shown the ability to spread the ball around to the multitude of receiving options on the Colts offense. Even though there was some uncertainty early on as to whom would be the primary tight end for the Colts, Allen has cemented himself atop the tight end depth chart, proving to be the superior option in the passing game between Allen and Luck’s college teammate, Coby Fleener. Despite not having a high-volume of targets, Allen makes the most of his opportunities, finding paydirt in all but two games this season. This week Allen gets an owner friendly matchup against a Giants defense that is currently allowing the 10th most fantasy points to opposing tight ends, and just gave up two touchdowns to Cowboys tight end Gavin Escobar in week 8. Due to the recent history, and the Colts offense being one of the best in the league, I see Allen as a top-10 play in a week owners are scrambling to find bye-week replacements. Garçon owner’s are likely getting very frustrated with the Redskins receiver due to the reduction in fantasy production in Jay Gruden’s offense. However, this is the week I feel Garçon finally busts out of his slump. With Robert Griffin III officially ruled active for the Redskins week 9 matchup with the Vikings, look for Garçon to once again be the focal point of the Redskins passing game. Despite having a suspect sophomore season, Garçon still led the team NFL in targets and finished second in receiving yards. This year, it was looking as if the two were going to continue their ways, as Garçon led the Redskins in targets (12) and receptions (10) in the team’s week one loss to the Texans. Despite having a tough matchup with a Vikings defense that ranks in the top-5 in terms of yards-per-game I expect Griffin to try and establish a rhythm with both of his receivers, utilizing the short passing and screen game to get Griffin some early completions. I know that it has been hard to trust Garçon on a weekly basis, but if you had the patience I think you are going to be drastically rewarded very soon. Despite having the big-play potential of the Cardinals receivers, third-year wide receiver Michael Floyd has struggled, failing to top 50 receiving yards or five receptions in any of his last five games. Floyd has been saved by a two touchdowns in his last three games to save any fantasy relevance, but with nagging injuries and an inconsistent workload, Floyd may be someone to keep on your bench this weekend. It has been no secret that Floyd has been battling some lingering injuries over the last few weeks. He tweaked his knee last week against the Eagles, and even though Floyd was able to remain in the game the team started to feature rookie John Brown as the team’s vertical threat, showing the injury may be more serious than originally led on. Floyd has practiced in full this week and is on track to play, but I know as a fantasy owner I would feel much more comfortable rolling with Fitzgerald, or even the rookie John Brown as a potential sleeper, rather than roll the dice on potentially damaged goods. Despite having being one of the most well known tight ends in the NFL, Vernon Davis is on the verge of being droppable for fantasy football owners. Since destroying the Cowboys in week one with two receiving touchdowns, Davis has failed to register a game with more than 3 receptions or 40 yards in any game. Davis has also had a run-in with the injury bug, suffering back spasms after taking an award shot to the back from Demeco Ryans in week 4, causing him to miss the teams next game. If I were a Vernon Davis owner, I would keep him as far away as you can from your starting lineup. As shaky as Davis is there are plenty of other options if you are looking for a potential bye week fill-in, such as Clay Harbor (v. Bengals) or Jace Amaro (v. Chiefs). While none of these players will produce at the TE1 level, both of them I feel have a better chance of reaching fantasy relevance than Davis does in week 9. There have been a lot of changes to the Cleveland Browns since last season. A pass-happy team in 2013, there's reason to believe the running game may be creeping its way back into the team's philosophy this season. But with no convincing No. 1 running back on its roster just yet, it leaves room for speculation regarding who the best fantasy running back could be in Cleveland for 2014. It all started with a shift in management. Vertical passing enthusiast Norv Turner took his talents to Minnesota and was replaced by former Redskins offensive coordinator Kyle Shanahan, a guy who's often been jokingly referred to as an 'anti-fantasy football' coordinator. Alfred Morris owner's from 2013 can attest to that. You could play a sad violin for Morris owners last season, as they saw their touchdown points gobbled up when Shanhan opted to dial up several doses of Roy Helu on the goal line last season. Morris still went on to have a solid season in 2013 with 1,275 rushing yards, but his touchdown total nearly halved after he finished with 7 compared to the 13 he had during his rookie season. Unlike Turner, Shanahan's offensive philosophy centers around a balance of run and pass. He has proven effective at managing quarterbacks with vastly different styles as well. He helped Texans' Matt Schaub throw for a lot of yards in Houston and also ushered in the zone-read in Washington under the athletic Robert Griffin III. With Shanahan's equally favored approach to both the ground and aerial game, it creates some fantasy intrigue for owner's who may be looking at some stat potential out of the Browns backfield. It can't get much worse for Cleveland in the running category from 2013, as the Browns ranked 30th in rushing attempts with 348. A good running game starts with the guys up front, and the Cleveland Browns have one of the better offensive lines in the NFL. Center Alex Mack is a two-time pro bowler and has been a fixture on the Browns' offensive line since Cleveland drafted him in 2009. Mack provided the blocking for several highlight games early in his career, including Jerome Harrison's 286-yard rushing effort which ranked third-most all time for one game. Left tackle Joe Thomas remains one of the best pass protectors in the league, though the Browns one weakness could be at right tackle with Mitchell Schwartz. Schwartz was a liability in pass protection last year, and while Shanahan believes he's a good fit for his zone-blocking scheme, one has to wonder if the 6'5, 320 lb Schwartz will be able to hack a run offense usually designed for more athletic lineman. Schwartz was such a liability in fact that the Browns used plenty of resources to cover up for him. According to pro football focus, the Browns led the league in chip blocks for both the running back and tight end positions last season to help alleviate some of their protection problems. 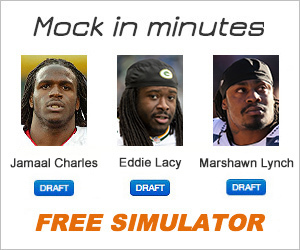 However, that may be a tougher task this season due to their inexperienced backfield. The current crop of running backs may not be best suited for providing quality pass protection. According to pro football focus, current starting running back Ben Tate ranked 39th in pass blocking efficiency in a pool of 46 running backs who saw at least 40 pass blocking snaps last year. Behind Tate, you have two rookies in Terrance West and Isaiah Crowell who both of which weren't known as pass blockers in college. We mentioned his name finally, and the undrafted rookie out of Alabama State has some upside for stashing on your roster right now. Crowell's college career started off very promising. He landed a starting spot with the Georgia Bulldogs when he was just a freshman. Playing against several vaunted defenses in the SEC, Crowell went on to have several big games including a 30-carry, 147-yard performance against Ole Miss. He finished his freshman year with 856 rushing yards and 5 touchdowns, but it was disciplinary problems that kept him from continuing what looked like a future successful collegiate career with the Bulldogs. The following season, Crowell was dismissed from Georgia after he was arrested on a drug charge. He ended up enrolling at Alabama State and finished as the leading rusher at Alabama State and led the Hornets to a 7-4 record. Some of his highlights can be seen in the video below. His run at the :37 second mark of this video is especially impressive. Current starter Ben Tate is expected to be an every-down back for Cleveland starting out, which isn't surprising considering the fifth-year RB has proven reliable with a respectable 4.7 ypc average while playing behind Arian Foster in Houston for three seasons. Still, it's Tate's first go in the workhorse role, which is a job only a handful of running backs have proven able to hack at a consistent level. Tate played in only 11 games in 2012 and was eventually placed on injury reserve with cracked ribs in 2013, so durability may also be an issue. Current No. 2 running back West struggled during preseason, averaging just 2.9 yards per carry and zero touchdowns. Crowell, on the other hand, notched 105 yards on 15 carries (7 YPC) and a touchdown. If Crowell can keep his previous run ins with the law a thing of the past, he's got real potential to be a starter on the Browns at some point if the chips fall the right way. Which Cleveland Browns receiver could emerge in Gordon's absence? One of the most talented dogs in the dog pound was kenneled for 2014, and it leaves fantasy owners wondering if anybody else is capable of leading the pack.